7. Hosting a podcast creates opportunities like; guest speaking engagements, & joint ventures. 8. It gives you more clarity in your business. 9. Podcasting not only grows an audience but, done correctly you can increase your email list. 10. Podcasting keeps you committed to your business and your success. When you show up and use your voice on your platform and in this case on your podcast, you're positioning yourself as an authority on the topic you are speaking of. Authority is closely related to leadership and leaders influence people by sharing their perspectives and opinions on the subject they have experience and expertise. Positioning yourself this way can lead to a census that you are the go-to person to learn from or to be entertained. And that leads to them wanting more of you, subscribing to your podcast and opting into your free and paid offers. 2. Podcasting has the potential to give you massive exposure online by publishing your podcast to all the popular platforms... even if you've never used them before. This kind of exposure is crazy good and has the potential to grow your audience, network, influence, and business all at once! 3. Podcasting allows you to attract an authentic and engaged audience. People who subscribe and listen to your podcast went out of their way to listen to your episode and subscribe to your podcast and listen to your episodes. This level of engagement with you is a commitment on their part. It's them saying I like you and I want to hear what you have to offer every week. 4. Consistently posting content (your episodes) gives your business momentum. There's nothing like creating one piece of useful content regularly and distributing it everywhere, so you don't have to re-create the wheel. It's called repurposing content except with Libsyn it automatically does all the work for you when it is set-up and configured correctly. 5. You can help your ideal customer solve their problems. One thing that entrepreneurs have in common is the desire to serve their audience. A podcast creates a sturdy platform and easily consumable content on the go. 6. You establish know, like and trust which is what customers need before they buy. We can all relate to the fact that we like to buy from people we know like and trust. That's why celebrities and influencers are often hired to endorse and promote products, services, and events. A podcast establishes you as an influencer, and when you put out consistent, and valuable content that solves your customer's problems, they see you as the influencer and are more likely to trust you and buy your products. 7. Hosting a podcast sets up opportunities like; guest speaking engagements, endorsement opportunities and joint ventures which can further increase your reach and influence. 8. 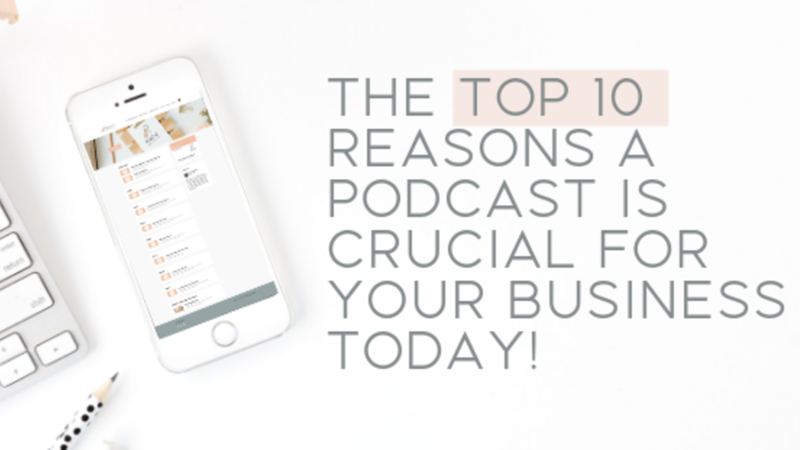 Hosting a podcast has the potential to give you more clarity in your business when you're authentically , and consistently and willing to take yourself outside of your comfort zone and really serve your audience. 9. Podcasting not only grows your audience but, done correctly you can increase your email list. Create opportunities and offers for your audience to opt-in to your email list by creating free and paid handouts, training and other relevant information that they are seeking. 10. Podcasting keeps you committed to your business and your success. When you go outside of your comfort zone magical things happen.